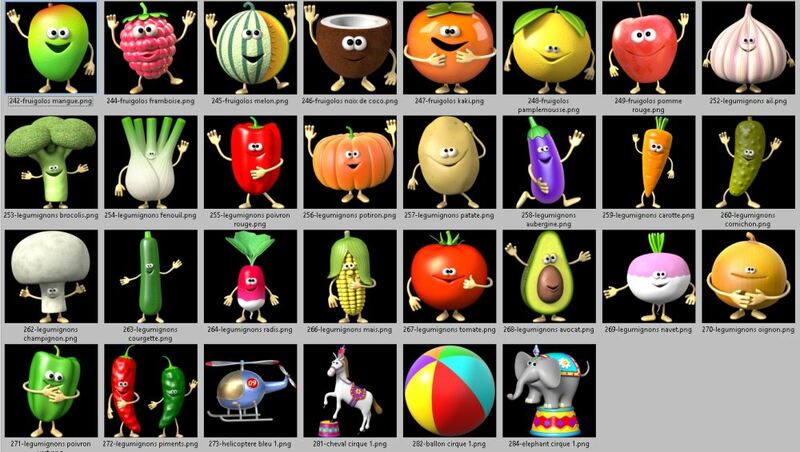 In this issue, we have another batch of the toon brushes collection, aka 3d stickers: Batch #7, mostly images of fruits and vegetables, so get your fruits and veggies! 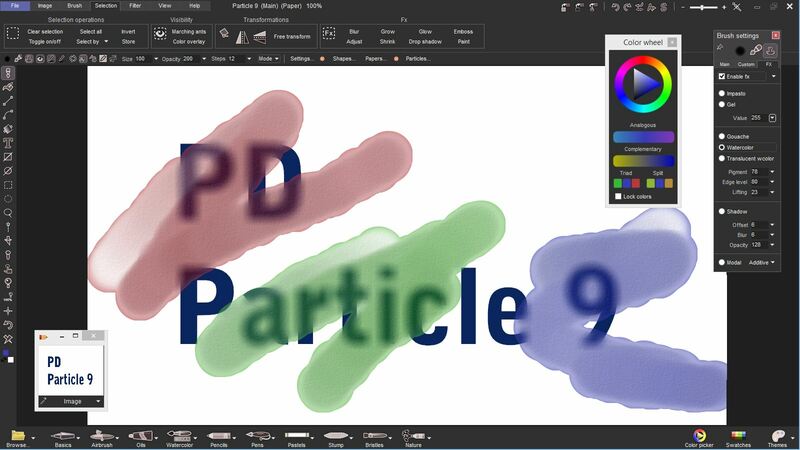 We also describe the newest member of PD Particles, the all new PD Particle 9. 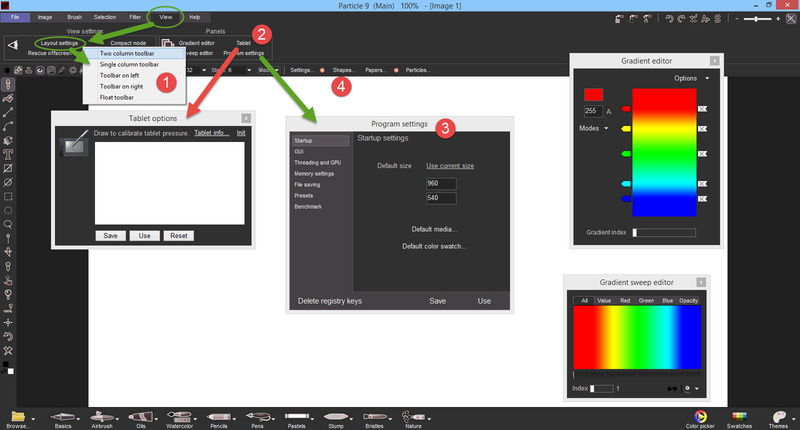 And we have quite a bunch of new tutorials and videos made mostly in PD Howler. Also, all through the Month of June and through the July 4 weekend, we're running a special promotion for PD Howler: a discount of 30%. 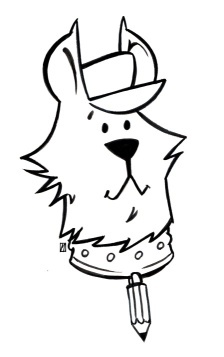 Here's the new collection, batch #7 has 30 new brush images in Dogwaffle Media format. No re-distribution or format conversion please. If you're interested in licensing these or others from Michel Agullo's collections, such as for distribution in apps and games, please contact us to discuss conditions. It could be free too. Just a few weeks ago, we released the newest edition of PD Particles: PD Particle 9. 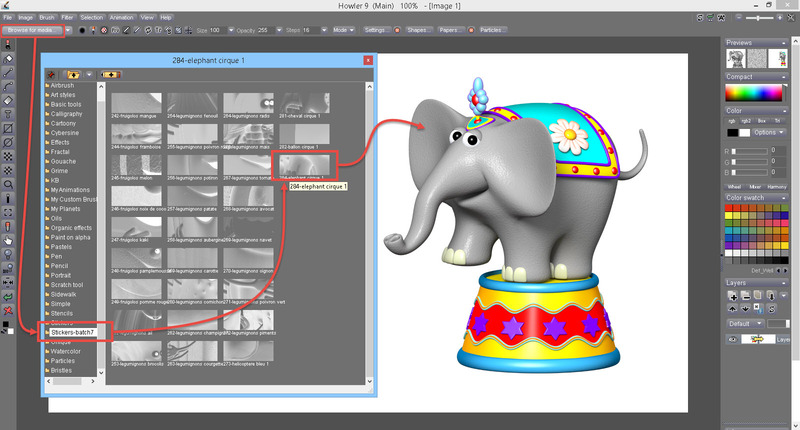 PD Particle 9 is a light version derived from PD Artist. It doesn't do animations or video work like motion prediction, that's something you see in PD Howler. 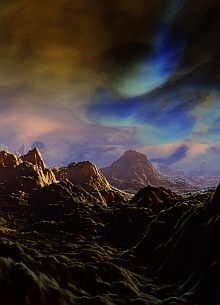 It also has fewer filters than PD Artist and PD Howler. 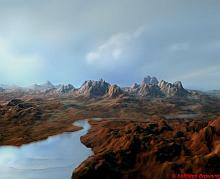 For example, it doesn't have the 3D Designer or Puppy Ray for 3D landscape rendering. On the flip side, it is much more affordably priced at just $7.99, and it has some great new interface ideas, including pinch zoom if you have a touchscreen. 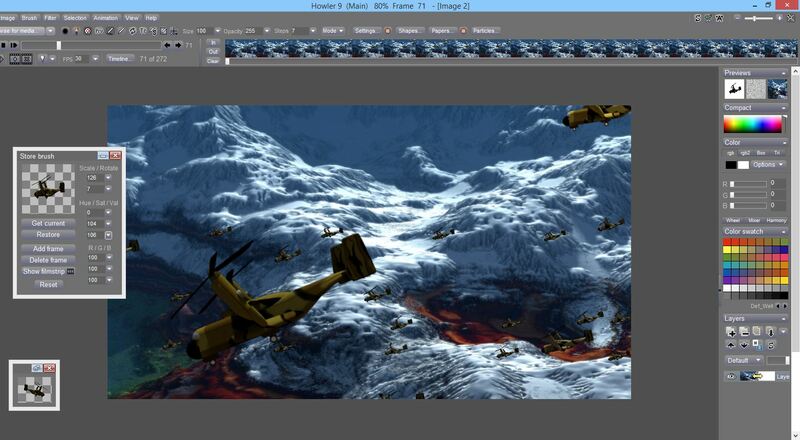 If you have been using the older version of PD Particles (and boy is it old :-) .... ), i.e. PD Particles 1.x, you'll be happy to know that PD Particle 9 now includes the full Custom brushes (which it didn't in v1). 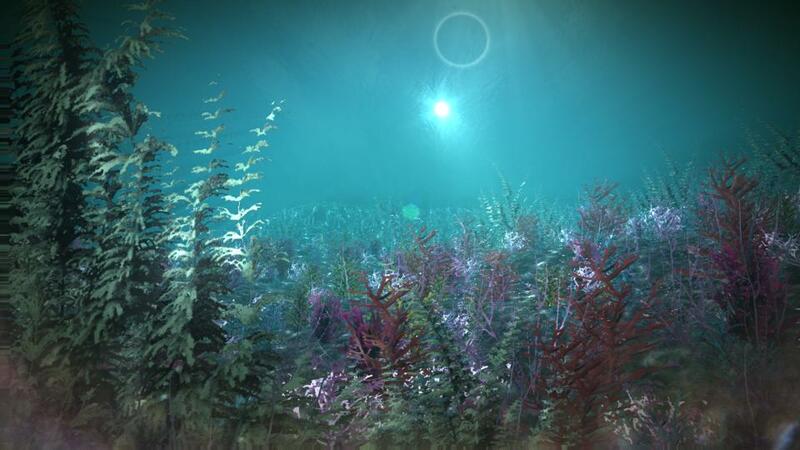 It also has the Bristle brushes, Orbicle brushes and the awesome Foliage brushes(!) so it goes way beyond what the old PD Particles had. Along the bottom left of the images, you'll notice a few handy shorcuts to access various types of media, i.e. brushes. 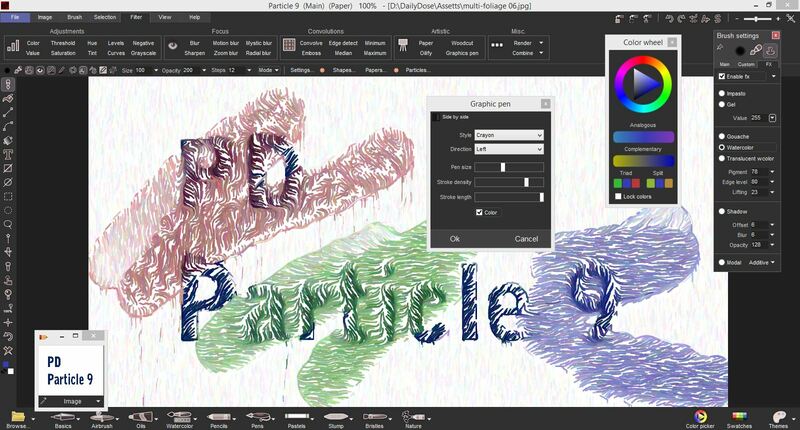 PD Particle 9 has a few other improvements over earlier versions. "allow brush transforms" is automatic when changing brush size. 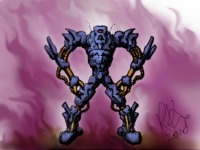 We've had some great feedback from other artists who love to sketch and paint. We hope you'll like it too. No discount coupon needed, this sale is automatic. Instead of $89, once you access the shopping cart from http://www.thebest3d.com/dogwaffle/sales and click on the link for PD Howler 9.6, you'll see the reduced price: $62.30!. This offer is good through the July 4 weekend. Happy Independence Day! Of course, if you already have a prior version, such as v9.2, or v8 and earlier, you should qualify for even better discounts, up to 72% off! Contact us if you need a new discount coupon to upgrade or sidegrade from PD Artist and PD Particles. Also, you may see even better deals from the developer directly at www.squirreldome.com or when ordering through Steam. http://www.thebest3d.com/howler/steam - Be sure to check it out if these are options for you too.